Since Vitamins A and C help our bodies to process seasonal allergies, consider eating foods high in these two vitamins. 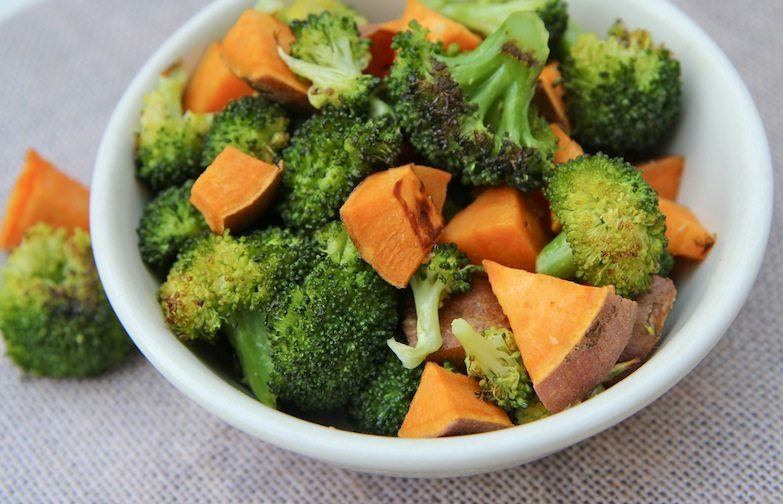 Foods such as broccoli, sweet potatoes, baked potatoes, red and green pepper, spinach, and carrots are high in either or both Vitamin A and C.
Check out this recipe for "Roasted Broccoli and Sweet Potatoes… Yes Please!" courtesy of Divas Can Cook, which has both broccoli and sweet potatoes – two foods that are in the top 5 “Selected food Sources (of Vitamin A or C)” by the National Institute of Health, Office of Dietary Supplements. I'm in love with oven roasted broccoli! Pair it up with sweet potatoes for the perfect side dish or snack. I ate a whole pan of this stuff and I'm not a big veggie lover!